Institute for Safe Medication Practices: Medication safety alerts, error reporting, self assessment of safety practices. Most comprehensive site for medication safety issues. Patient Safety Movement Foundation (PSMF) The Patient Safety Movement Foundation was established to reduce that number of preventable deaths in hospitals to 0 by 2020. Problems are addressed with actionable solutions for patient safety by working collaboratively with patients, healthcare providers, medical technology companies, government, employers, and private payers. Development of Safer Standardized ConnectionsStayConnected is a communications program created to facilitate a successful transition from medical device applications. Emergency Care Research Institute (ECRI): medical device safety focus. Current hazard alerts. Accident and forensic investigation services. Agency for Healthcare Research and Quality (AHRQ): The US government agency tasked with improving patient safety. Web M&M: M&M presentations on line. Includes surgery and anesthesia cases. 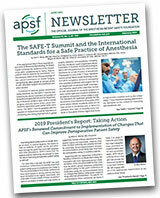 NPSF patient safety listserv archives: archives of patient safety topics. easily searchable. A good place to look for how others think about an issue of concern to you.